Expanded playoffs apparently a done deal. Official announcement tomorrow. Probably would have been wiser to wait until next year, rather than crowbar it into the schedule this year, but o.k. Love it. Would've hated it if it meant another series but those one game play-ins are so good. And it makes winning the division mean more. LET THE ALMANAC PICK SONGS / LIVE TRAX. 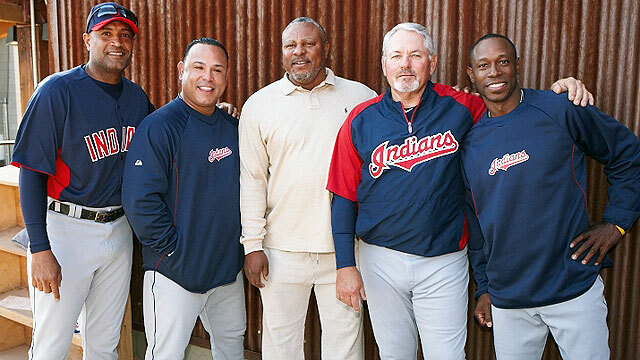 It's exactly the type of thing that the Indians could really benefit from this year. I for one can't wait to see my Red Sox get beat by not one, but two teams for the wild card at the end of September. Should be a blast. You have two World Championships in the last 8 years. I know I should be thankful (and I am) but I think that's part of the problem with the Sox right now, they won those two so we're supposed to go easy on them. Lofton still looks he could run em down. It is amazing how bad Baerga became as soon as he got traded to the Mets. Gotta love Lofton. One of my favorite players. how can I get the best deal on MLB.TV or the package through DirecTV? I did a google search, checked slickdeals, etc. and haven't found much. Should I just wait? I go with MLB.TV premium. Cheaper than Extra Innings, and quite honestly just better. I got MLB TV premium with the minor league package. I've purchased MLB.tv and Extra Innings in the past, and while it'd be phenomenal if I lived out of the NY market, I just never used it much. Between getting all the Mets (and Yanks) games, all the games on ESPN, Fox, TBS, and especially now the MLB Network, I just don't need it. And the MLB Network every night of the season cuts in and out of games as things happen, it's great. And on the go I love the MLB At Bat app to follow fantasy players, etc. But, like I said, if you live outside your team's area, MLB.tv is awesome and better than Extra Innings. Thanks . yep, I'm a Brewer fan living in Colorado. Should have bought last year but didn't. Paul Bearer was Kane's father, but not Undertaker's. Taker killed his parents in a funeral home fire, but Bearer knocked up Undertaker's mom with Kane. This is the most absurd post I've ever made on a message board. All times are GMT -5. The time now is 03:32 PM.